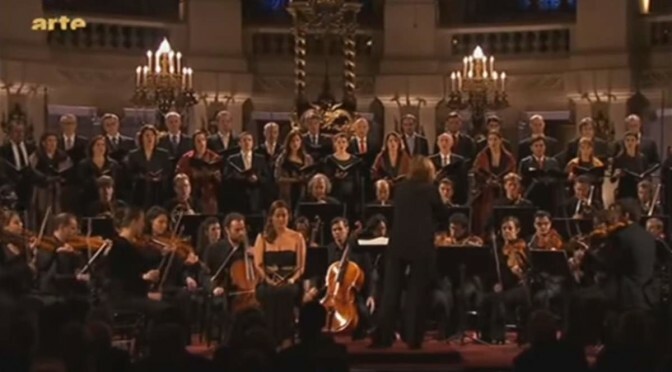 Conducted by the French conductor Laurence Equilbey, Insula orchestra performs Wolfgang Amadeus Mozart’s Great Mass in C minor (German: Große Messe in c-Moll), K. 427/417a. Soloists: Julie Fuchs (soprano), Ann Hallenberg (mezzo-soprano), Benjamin Hulett (tenor), Markus Werba (baritone). Recorded at the Grande Chapelle du Séminaire Saint-Sulpice. With the Requiem Mass, which was left unfinished at the Austrian composer’s death, the Great Mass is one of the last two musical setting of the mass by Mozart, and also left unfinished. He composed it in Vienna in 1782 and 1783, when he was no longer a church musician of the Salzburg Cathedral. The first performance took place in Salzburg on 26 October 1783. The work is incomplete, missing all of the Credo following the aria “Et incarnatus est” (the orchestration of the Credo is also incomplete) and all of the Agnus Dei. The Sanctus is partially lost and requires editorial reconstruction. There is a good deal of speculation concerning why the work was left unfinished. Given the absolute necessity of a complete text for liturgical use, it is likely that Mozart spliced in movements from his earlier masses for the premiere, although Richard Maunder has noted that the surviving parts (including an organ part) contain only the completed movements. For purposes of modern performances, the editions and completions available are those by H. C. Robbins Landon (Eulenburg), Helmut Eder (Bärenreiter), Richard Maunder (Oxford University Press), Philip Wilby (Novello), Robert Levin (Carus-Verlag) and Benjamin-Gunnar Cohrs (Musikproduktion Höflich). Robert Xavier Rodriguez has also completed the Agnus Dei. Mozart later reused the music from the Kyrie and Gloria, almost without changes except for the text, in the cantata Davidde penitente, K. 469. “First, Mozart made his living through music. Nobody commissioned the mass, nor did Mozart then have a job that required him to write one. He needed to bring in money, and the mass fell by the wayside. The easiest promises to break are the ones you make to yourself. On the other hand, Mozart’s first-born, Raimund Leopold, had died in infancy. It may well have been that Mozart began to associate the mass, conceived as a celebration of his marriage, with his dead son and thus lost the drive to finish it.